If you have a Frozen Shoulder Tendonitis is in there too. Frozen Shoulder doesn't just show up out of the blue, for no reason. So if you have shoulder issues now, it is entirely likely that you had a Shoulder Tendonitis dynamic in place, making things tight and making things hurt, before you started having limited movement of the shoulder. So what is frozen shoulder, you ask. The answer is a bit broad. People, even doctors, but the label of 'Frozen Shoulder' on a range of shoulder pain, reduced range of motion, and limited use situations. Because the term is broad and the physical cause not fully understood by the medical establishment, the term Frozen Shoulder Syndrome is also used to describe a set of symptoms associated with this shoulder problem. Technically, if you have pain and limited range of motion, that is NOT Frozen Shoulder, although some will diagnose that. Technically, if you have pain and can only go 40% of your range before your arm comes to a stop and can't go any farther, that is NOT Frozen Shoulder, though some will say it is just because you have limitation and pain. Technically, Frozen Shoulder is when the actual shoulder joint gets stuck and will not articulate, meaning the bones are stuck together, basically. It's more complicated than that, of course, but basically Frozen Shoulder means that the joint itself is locked, stuck, and/or immobile. This also primarily includes the joint capsule itself becoming thicker and and contracting down. So a Frozen Shoulder is not just the tight muscles and inflammation of Shoulder Tendonitis, it also includes shrinkage of the joint capsule connective tissue and loss of lubrication to the inner joint. Want to know what causes Frozen Shoulder? Good. It's pretty easy to explain. Ultimately, there are two causes of Frozen Shoulder. Do you see a theme there? Why is lack of motion such a problem? Maybe you fall on your shoulder, with arm outstretched or not. Maybe you are a weekend warrior and finish your game with shoulder pain. Maybe you are in a car crash, or fall down the stairs, or somebody runs into your shoulder. One way or another, you hurt your shoulder. And it hurts. And what do we do when something hurts? We stop moving it. Often we end up in a sling, or a cast. But most of the time we just stop using our arm and shoulder. So, we stop using our shoulder. Down the page I'll explain what happens then. As you will see on the Tendonitis page, the Tendonitis dynamic causes muscles to get tight and stay tight, while the Pain Causing Dynamic creates more pain, more tightness, and more nervous system unhappiness. And what do we do when something hurts? We stop using it. In the situation of Shoulder Tendonitis, we -slowly- use our arm and shoulder less and less, our range of motion slowly diminishes as we move less to 'manage' and avoid the onset of pain. And the shoulder moves less and less. Chronically tight muscles, like from a Tendonitis dynamic, can restrict range of motion. Over time, connective tissue shrink wraps down around tight muscles. This literally restricts range of motion. We're talking about the shoulder joint and shoulder joint capsule here. What happens with lack of motion that causes Frozen Shoulder Tendonitis? 1. Muscles get tight, due to pain and use and use over time. They stay tight. Use it or lose it, as they say, but here we mean use your range of motion, or lose it. 2. Connective tissue shrink wraps around tight muscles (and joint capsule). 3. Less motion causes less synovial fluid lubrication of the joint. 5. The nervous system senses a compromised joint, and will literally not allow muscles to lengthen, which lessens and/or stops mobility. 6. You move less. Muscles get tight. Connective tissue shrink wraps. Ultimately, this is the Pain Causing Dynamic. So the joint is compressed, as in the case of Shoulder Impingement, the nervous system won't let the arm go past a certain point, connective tissue is shrunk wrapped down and constrictive, and chronic and possibly acute inflammation is in place. This is a great recipe for losing movement in your shoulder. 1. The upper arm moves less, or not at all, which means there is little or not movement of and in the shoulder joint. Included in this is everything from the above scenario. 2. The less movement of the joint, the less synovial fluid lubrication gets created. This makes the inner joint, dry, tacky, sticky. 3. Inflammation in the joint, which increases surrounding muscle tightness and pain in and outside the joint. 4. Just like the connective tissue of muscles can literally get sticky and bond together so can the interior parts of a joint. The un-lubricated connective tissue around the bones sticks together, and eventually essentially becomes a single structure. This is true frozen shoulder. The bones of the joint are 'frozen' together. Most of the time, with appropriate skilled Massage Therapy and self care at home, you can get your shoulder back in working order. For the vast majority of Frozen Shoulder Tendonitis cases, what exactly are surgeons going to do surgery -on-? It is a dynamic, an ecology. Surgery may allow more space, more freedom of movement, but it doesn't affect a person's habits and such that caused it in the first place. If the shoulder is truly frozen, there are some manual methods of 'breaking' the sticky joint (which aren't particularly pleasant). If it's frozen bad enough, then surgery may be not a horrible option. But in most cases, in my opinion, it is overkill. Granted, as a society we do go for the quick fix, without doing the work to get one's body healthy again, and if that's what people want to do, great. Almost always, with the appropriate professional care and self care at home, a person can rehab their frozen shoulder tendonitis and turn it into a fine shoulder. The RIGHT Frozen Shoulder Tendonitis Treatment and Therapy can reliably do wonders. Frozen Shoulder Surgery for Frozen Shoulder Syndrome still requires all the same self care if a person wants lasting results. Here is a simple Home Treatment For Frozen Shoulder. There are some other things to consider when looking at Frozen Shoulder Syndrome. Most people that suffer from this shoulder problem are in the age range of ages 40-60. 1. Not enough exercise, and not enough exercise that utilizes a full and varied range of arm motion. 2. Not enough Magnesium in the diet. 3. Not enough protein and vital nutrients in the diet, as provided by Bone Broth. Frozen Shoulder Tendonitis shows up for a variety of reasons. Deal with those reasons, deal with the current results, and you can get your painful, frozen shoulder happy and healthy again. 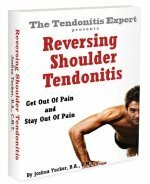 Go to the top of this Frozen Shoulder Tendonitis page.